Robinson, T. J., V. Wilson, D. S. Gallagher, Jr., J. F. Taylor, S. K. Davis, W. R. Harrison, F. F. Elder. 1996. Chromosomal evolution in duiker antelope (Cephalophinae: Bovidae): karyotype comparisons, fluorescence in situ hybridization, and rampant X chromosome variation. Cytogenetics and Cell Genetics 73(1-2):116-122. Van Vuuren, B. J. and T. J. Robinson. 2001. Retrieval of four adaptive lineages in duiker antelope: evidence from mitochondrial DNA sequences and fluorescence in situ hybridation. Molecular Phylogenetics and Evolution 20:409-425. Gleanings from the Menagerie and Aviary at Knowsley Hall, by John Edward Gray, Liverpool, 1846. Page: Tree of Life Cephalophinae. 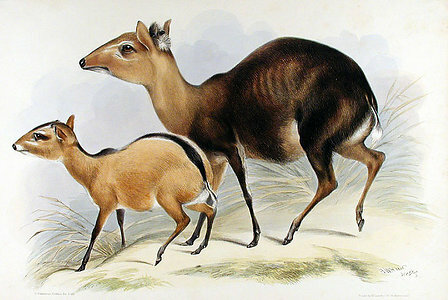 duikers. The TEXT of this page is licensed under the Creative Commons Attribution-NonCommercial License - Version 3.0. Note that images and other media featured on this page are each governed by their own license, and they may or may not be available for reuse. Click on an image or a media link to access the media data window, which provides the relevant licensing information. For the general terms and conditions of ToL material reuse and redistribution, please see the Tree of Life Copyright Policies.